Frequented by Royals, rock stars and the rich and dripping with class, privilege and luxury, the Ritz has long enjoyed a reputation as the best joint in town – any town – Paris, New York, Rome or London. The epitome of all that is exclusive and, often, unattainable, to ordinary folk, it has informed song, in the cheeky “Putting on the Ritz”, story, in F. Scott Fitzgerald’s whimsical “A diamond as big as the Ritz” and popular expressions, in those stock retorts to dissatisfaction with fare or service at family tables the world over – “What do you think this is, the Ritz?” or even “Where do you think you are, the Ritz?” So, what, really, makes the Ritz so special? What is it actually like behind that grand façade? What exactly is it that brings in all those big names and megabucks? I popped in for lunch recently to find out. Arrival at the Ritz is a kind gauntlet run (and probably a well disguised presentation and security check, too) past top-hatted, waist-coated and bowing doormen, from the taxi, up the steps, through glass doors (opened and held by more top-hatted, bowing waist-coats) and across a lobby gleaming with polished wood. The interior is a symphony for the eye – no discordant note of mismatched colour or misplaced decoration here – no, everything, from the perfectly pleated and draped curtains, the deep-piled carpets, the ceiling roses, the choirs of sculpted cherubs, the plaster cornices, the chandeliers bristling with twinkling bulbs, the huge wall mirrors, the furniture, the table linen, the china to the cutlery, is in perfect, soft-sheened pink, green, cream, white, gold, glass and silver baroque harmony. Classical piano music plays quietly against a background of discreet voices and the subdued tinkle of silver – no musak, no bursts of raucous laughter, no clash of stainless steel or crash of smashing plates here. No camera flash distracts the guests or disturbs the subtle lighting. Photographs are not permitted at the Ritz. My three course lunch, from an unpretentious, English, three-choice menu, probably speaks for all Ritz cuisine. It all looked too good to eat but, in the end, tasted even better than it looked. The monkfish entrée was small, a manageable, melt-in-the-mouth lead-in to the “just-roast-pork-with-apple-sauce-and-four-veg.-but-oh-boy-what-they’ve-done-with-it” main, while the not too sweet and deliciously healthy vanilla yoghurt and fresh fruit dessert was the ideal finale. Service at the Ritz strikes the perfect balance between the discreet touch and the flourish. Glasses never empty while plates and cutlery come and go as if by magic. Serviettes flap into place with a flick and a twirl while courses are ferried by waiters in single file who lift their silver covers with one accord. Staff are formal but not stiff, friendly but not familiar, attentive but not intrusive, respectful but not obsequious, efficient but not brisk, and mindful of their jobs but not afraid to be themselves. 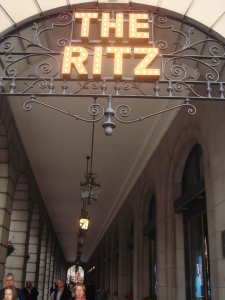 Undoubtedly, the Ritz is luxurious, classy and exclusive. But the thing that really made my Ritz experience so special and that would certainly bring me back again, is that it is beautiful, comfortable, pleasant and welcoming.